Shirtz took a vacation from his dealings with the underworld for a while and mingled amongst the humans to watch ‘Rango’. It seems he was pretty smitten with the film. That’s saying a lot from Shirtz. I always look forward to his reviews. Not only do you get his opinion on film, but you get a smidge of his seedy life story. Long live Shirtz. Enjoy the ‘Rango’ review. “No.” I can read her lips but not hear her voice over the mariachi music in my ears. “Bummer.” I say as she hands me my order with a disapproving look on her face. At that moment, a near traffic accident hurls Rango’s glass home to the boiling desert asphalt where it smashes into oblivion. Thus sending our hero on his epic quest for justice, identity, fame, love, water, and the spirit of the west. Suddenly the plane begins to shake fiercely! The fasten seat belt sign lights up and a rusty intercom voice tells us, “this is your captain speaking. We are experiencing some pretty harsh turbulence. We’re going to try climbing to 30,000 feet to get above this. Please fasten your seat belt and stay in your seat until such time as I can turn off the ‘fasten seat belt sign’. My seat-mate, a tourist visiting San Francisco from Taiwan, did not speak English. She smiled woundedly at my American intemperance and quietly prayed that I would not return from the lavatory. As I sauntered down the isle, I caught the eye of my lady friend and travel companion. Her slender frame was squeezed between two plus-sized women. Sisters from Omaha on their way to Miami from San Francisco. Neither one wanting the middle seat, they had decided to split themselves: one the window, one the isle. Scaling in at a shared 520 lbs. My lady friend squished between them. She retorted with a head tilt, and the squinting of eyes. No sabe. I repeated myself. This time, perhaps a bit too loud as an older couple to my left began to giggle in their matching red Hawaiian shirts. I looked over at them and they smiled approvingly up at me. Clearly, they were sharing a memory from their younger days when they had attempted a similar maneuver. … We missed the rest of “Rango”. I’m sure you understand. Priorities being what they are. Landing in Dallas, we stopped by our local video store: “Premier Video”. 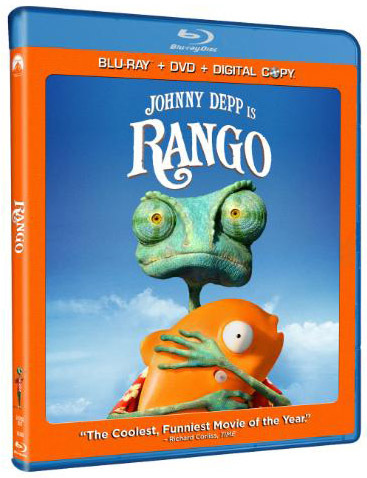 The Blu-Ray “extended version” of “Rango” was superb! It is a true western. A tribute to the American west and the traditions that we have been given by the greats! Plus it has a weird “acid trip” feeling third act. Not to mention, the best “from the grave” cameo in the history of western animation films. This entry was posted on Monday, July 11th, 2011 at 11:35 pm	and is filed under Film, News. You can follow any responses to this entry through the RSS 2.0 feed. You can skip to the end and leave a response. Pinging is currently not allowed. « Behold!!! ‘The Dark Knight Rises’ Poster Is Upon Us!! !